Star wars: may the carrier rocket "Angara" to become a competitor to the Falcon 9? Angara wins the power of rocket engines, but this advantage is offset by the difference in starting weight. And she is worth more than the ambitious project of Elon musk. The family of launch vehicles "Angara" was developed 20 years. Now, however, the most powerful of them "Angara A5" and found no use. The state will soon have to decide whether you need such a long project of Russia. 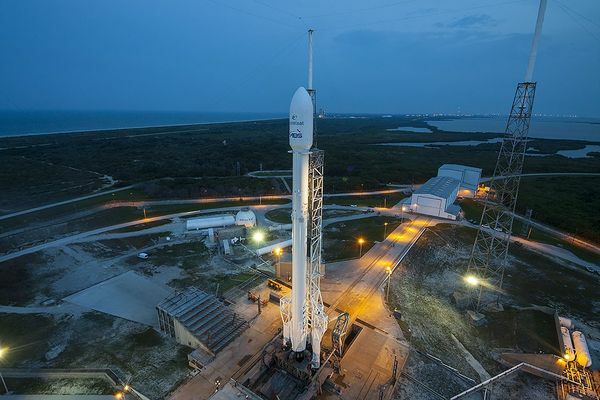 Unfortunately, in commercial terms "Angara A5" does not look like a competitor to the American workhorse, the Falcon 9, even if not to take into account the possibility of a return and reuse the first stage of the American rocket. At first glance, the vehicle "Angara A5" and the Falcon 9 are very similar. Both the oxygen-kerosene fuel. Both missiles belong to the class of heavy "Angara A5" maybe even more to reach low earth orbit: 25.8 t vs. 22.8 t Wages in the Khrunichev Center, which produces "the Hangar", is five times lower than SpaceX, and seemingly nothing is stopping Russian rocket scientists zaborot American "quack" and "PR". Now let's talk about the differences. Khrunichev Center Is 40 000. "Angara A5" — about $100 million. The Falcon 9 is about $70 million (one-time). "Angara A5" — 8 (4 a side of the accelerator, the second and third stages, payload fairing and upper stage). Falcon 9 — 3 (2 stages and fairing). "Angara A5" — 759 tons. Falcon 9 — 550 tons. "Angara A5" — 43,7 tons. The Falcon 9 is about 30 tons. "Angara A5" — about 35 sq. m.
Falcon 9 — some 22 sq. m.
"Angara A5" — 3 types of rocket engines from different manufacturers: 1-2 stage RD-191 (Khimki), 3-stage RD-0124 (Voronezh), the upper stage C5.98M (Voronezh) or 11Д58М (Queens). Falcon 9 — 1 engine type: Merlin: the differences between the 1st and 2nd stage only in the form of a nozzle. "Angara A5" — 500 km (if in Moscow), 2700 km (in the production of Omsk). Falcon 9 is less than 1 km (all parts are manufactured in Hawthorne). "Angara A5" — 780 km (Moscow-Minsk), km 5500 (Moscow East), 3500 km (Omsk-Moscow), 2000 km (Omsk-Moscow). Falcon 9 — 3600 km (Hawthorne Canaveral), 210 km (Hawthorne Vandenberg). The above data show that the "Angara" only wins in power of rocket engines, but this advantage is offset by the difference in starting weight. Our missile more powerful, but at the same time, a heavier one and a half times the drag of the above. A large number of elements complicates the design service — rocket pack need to collect before starting to fill, and the time and the number of employed workers. Costs adds a sophisticated and therefore more expensive construction of the launch facilities. Batch scheme from multiple modules purely geometrically losing the close-coupled scheme, that is why SpaceX immediately took up the development of heavy monoblock BFR, even before the successful launch of the Falcon Heavy that is collected via the batch scheme. Significant impact on the final price of the rocket is the ease of manufacture, and then the "Angara", which is produced in four cities, irrevocably loses the Falcon 9, which is created almost in one shop. The problem is not only in transport costs. Several plants employed in the production of one product increase the risks of delays, as acting Maritime rule: the speed of a squadron is determined by the speed of the slowest ship. The Falcon 9 is simpler in structure, lighter in weight, easier to manufacture and maintenance — this is determined by its low market value. No magic or mythical dumping is not here, just a competent approach to operational tasks. In this comparison much more looks designed "Soyuz-5" which repeats one-piece design "Zenith" and maybe borrow something from the Falcon 9. Although he still has difficulties with the manufacturing of different subassemblies in different cities. Will have to bear the transportation cost of logistics between Moscow, Voronezh and Samara. It was reportedthat by optimising production and high demand for launches of "Angara" heavy cost of the option may be reduced in half to two times. But in 2014 it did not need even the accident Angosat sent on the old Zenith. With the high price and lack of flying practice demand for "Hangar", not in the commercial market, so the only way to increase its production — internal procurement, but there is a new missile has nothing to offer, while flying old. In fact, on "the Hangar" rise of demand only in one case — if Russia refuses from all the other rockets. The above arguments make us wonder how our engineers could make so many egregious economic errors? But we should consider that they actually worked in the Soviet paradigm, when it is necessary to use all existing cooperation. That is, the "Hangar" was performing social tasks, providing work and Khimki, and the Queen, and Voronezh, and now the Omsk. Elon musk was easier, he immediately started a solution to the problem with the cost of production and the "empty place". The future of "Angara" is now possible only as a political safety net in the event of a threat of loss of Baikonur. The rocket has done its job — saved missile shots in a difficult transition period helped to develop a new generation of designers, who now have to put actual problems with market potential. The real space case today that state that the business will be settled more cheap "Unions" and "Protons", and then "Soyuz-5". This Russian competitor to the Falcon 9 is a "proton Average", a lightweight modification of the popular first in the world market of "Proton-M". The Russian space Agency has outlined a complete rejection of "Proton" in 2025, up to this time you can manage to create and "Soyuz-5" and to bring its performance up to comparable with the "Angara A5" and competitive with Falcon 9. Then you can forget about "the Hangar", as at the time forgot about the "Buran" — a great engineering project, which found no practical application.